To produce cereal bar or protein bar, we normally need to add glucose or maltose as binder. However, the binder is sticky, so after working a period of time, Cereal Bar Forming Machine is easy to gather a lot of dirties, which is forbidden by food manufacturer, also brought much troubles to operated who should clean the dirties everyday. Now, let us help you to settle the problem! 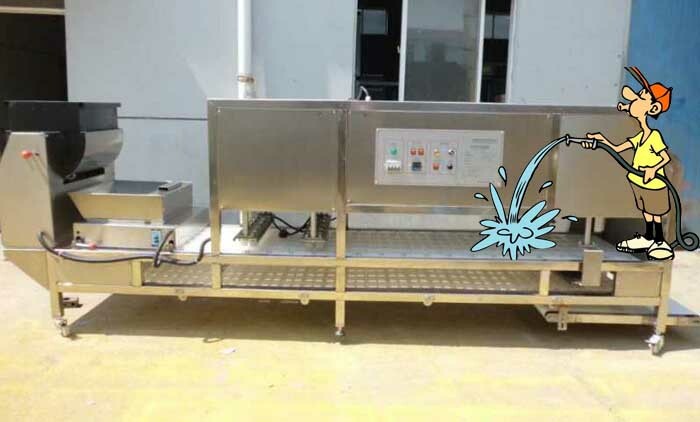 We have developed a new type of Protein Bar Forming Machine to realize water washing. For traditional Muesli Bar Forming Machine, the driving parts are installed under the molds. If we wash the molds by water, the driving electric parts will easily be destroyed by the moisture. But disassembling the molds for clean always cost so long time! So we overturn the structure by installing the molds under the driving parts, also make good sealing on the driving parts. Now it’s easy to clean the molds by water. Operators no need cost too much time and energy to clean the machine, also could always keep it clean! This new designed Healthy Bar Forming Machine has been patented because of the unique design. For more details, please contact Dragons Machine.